Please click the thumbnail to see the full-sized image. This remarkable statue group depicting a bull wracked by two lions is one of the most powerful works of art I have ever seen. Perhaps ten feet across, it once occupied the central pediment of the Hekatompedon temple, the predecessor of the Parthenon at the Acropolis of Athens. This temple was built in the late sixth century BCE during the Archaic period of Greek history, which saw a great influx of political and cultural influences from the Near East. It was during this time that Greece adopted the polis city-state model of political organization from the Fertile Crescent, where it had been in use since the first cities were built around 3200 BCE. Greek art, literature, and religion were transformed by the wave of ideas coming from the Near East. Archaic statues and vase paintings show a marked Mesopotamian influence. One of the earliest and most important literary sources for Greek religion, Hesiod’s Theogony, dates to this period, and shows the clear influence of the Babylonian epic Enuma elish, which we looked at in an earlier post on the Assyrian Tree of Life motif. This pediment sculpture group is itself Oriental in subject and style. As with the Tree of Life, this group features an axial primary subject, a bull, flanked by a pair of heraldic figures, in this case lions, in a typically Mesopotamian style. Animal battles were a popular subject of art throughout the eastern Mediterranean. Although it came to Greece through Mesopotamia, the lion-bull motif predates Sumerian civilization by tens of thousands of years. 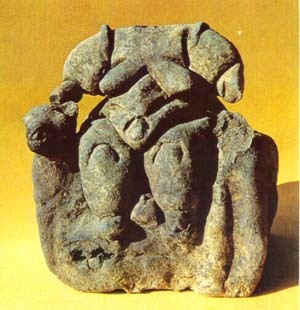 It is one of the oldest mythological symbols in the world, possibly as old as the Great Goddess motif of the Stone Age. It can be found in numerous cultures in a clear line of historical transmission. It passed from culture to culture during periods of contact, with each new group expressing the symbol with its own emphasis. It is a symbol of great complexity and range, and we can only begin to trace its history here. The basic sense of the bull brought down by beasts of prey is an image of the fundamental forces of life and death in a terrible, intense struggle. As an image of the conflict that provides the sustenance of life, the lion and the bull are bound together as a single symbol. In Ancient Greece, the bull is the sacrificial animal par excellence. The bull sacrifice played a prominent role in Hesiod’s Theogony, which was created in the same historical period as this statue group, and, as noted earlier, also shows a deep influence from the Near East. Theogony contains the earliest-known version of the Prometheus myth. In Hesiod’s telling, the tragic god enraged Zeus by establishing the ritual of the bull sacrifice such that the humans receive the flesh of the animal, while the gods receive only the fat and the bones. When Zeus learns of this betrayal, he proscribes a terrible punishment: “[W]ith anger ever in his mind, he would not give to the ash-trees the power of untiring fire for mortal men who live on the earth.” (1) That is to say, the ash tree keeps the fires of heaven locked within itself, so that wood must be burned for its vital essence to be released. Taken as a primitive scientific account, there is little merit to this hypothesis, but when interpreted symbolically, we immediately find several themes in common with the Tree of Life motif we considered earlier. In both groups, we have an image of the source of life, the “fire within the tree,” or the nourishing flesh, depicted on the central axis, flanked by fierce figures, and released by the action of the symmetrical pairs on either side. If the bull is taken as the life-giving principle, the lion must be interpreted as the dynamic force that activates its release. On the cosmological plane, we have an image of the circle of life in its mystery and terror; life devouring itself and begetting life, like an Ouroboros, a serpent devouring its own tail. On the psychological or spiritual plane, we have an image of the axis mundi, the illuminated life-center of all things, and that is experienced by consciousness in terms of pairs of opposites. The central axis is outside of time, like the holy mountain in Black Elk’s vision. The lions are symbolic of the action of time, always eating away at the life principle. We can thus connect the Norse motif with the story of Prometheus, who was likewise bound in agony, and speculate that both motifs may share a common origin in an unknown Proto-Indo-European antecedent, a tale told before the Dorian Greeks and Germanic tribes differentiated. And can this passage be read without calling to mind the Buddha’s Tree of Enlightenment, or Christ upon the Cross? If we follow the flowering tree of Indo-European culture deeper toward its roots, we will also find a clear link to the great god Shiva of Hinduism, who not only symbolizes devouring time, but is invariably paired with Nandi the bull, his yana, or vehicle. It will not surprise us, then, to learn that Shiva’s consort Parvati is paired with a lion. In their combined aspect, as the god Ardhanarishvara, Shiva and Parvati are united as a single image, flanked by a bull on one side and a lion on the other. 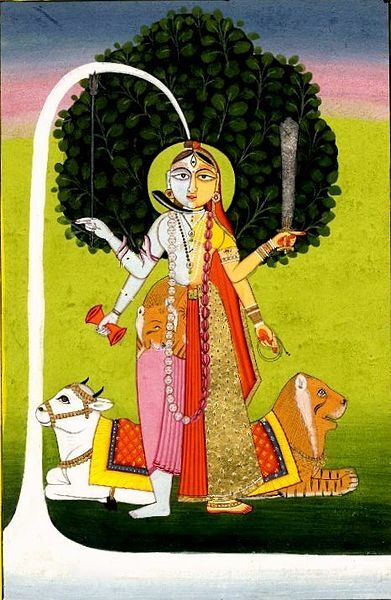 In this nineteenth century painting from the British Museum, Ardhanarishvara is aligned with an axial tree, and the waters of immortality overflow from the god’s crown. And is it my imagination, or is this tree clearly a Ficus religiosa, or Bodhi Tree? In the symbolic language of Sumer, the lion is the great solar animal. Just as the light of the sun never varies, the lion exemplifies the clear light of awareness of eternity. The bull represents the lunar principle, which, waxing and waning in a constant cycle, exemplifies consciousness in the field of time. While the lion-consciousness is eternal and unchanging, the bull-consciousness, like the light of the moon, follows an eternal cycle of death and resurrection. As we can readily see by now, the scope of the lion-bull motif is so vast that one cannot quickly take its measure. However, by situating it within its field of transmission, and by looking at its direct points of contact with adjacent images, the symbol begins to speak for itself. It is no mere sign of death, but an image of sacrifice and release, and of the tragedy that waters the roots of the great heaven-tree. By contemplating this image, our perspective on the cosmic struggle can be elevated to a higher vantage point, in which the participants of the deadly conflict at the heart of life become participants of the cycle, integrated symbolically into a partless whole, and the scene is raised from brutal tragedy to holy mystery. By virtue of this profound resonance, this sculpture group earned its stature as the primary image of the great temple of Athens that presided before the Parthenon was built. Its evocative power comes through directly by its force as a work of art, apart from its mythological implications. These pictures can only give a rough sense of its potency, and if you find yourself in Athens, I strongly encourage a trip to the Acropolis Museum, where it may be viewed. It is a most extraordinary museum. The lion-bull symbol is far older than Sumer, and probably came to the Fertile Crescent through the Anatolian religious culture that existed in the early millennia of agriculture in the Taurus Mountains. The ancient urban center of Çatalhöyük, for example, is crowded with bull-horn altars, and is famous for its statue of an enthroned fertility-type goddess flanked by lions. In its earlier, matriarchal inflection, we often find the Great Goddess in this aspect, at the heart of these triadic images, instead of the World Tree. 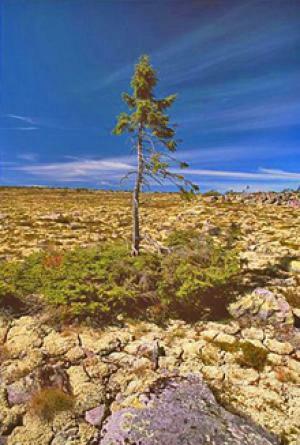 As symbols of the life-giving power of nature, the tree and the Great Mother are roughly equivalent, and they have been used as synonymous motifs in religious art for tens of thousands of years. In the earliest-known religious sanctuary that features representational art, the Chauvet caves of France, first utilized around 30,000 BCE in the Aurignacian period of the Paleolithic, we find a substantially comparable mythological motif presented as the central figure of the Salle du Fond, the deepest and most remote chamber in the complex. If the journey into the cave represents a shamanic journey of initiation, as many experts on Paleolithic art believe (5), then this image depicts the central mystery recognized by the earliest-known symbolic religious culture. On a great stalactite descending from the center of the cave, we find a charcoal drawing depicting the pubic triangle of a classic stone age Venus-type goddess, flanked on either side by a lion and a bison. (1) Hesiod. Trans. by M. L. West. Theogony; Works and Days. Oxford University Press. 1988. p. 20. (2) Hávamál, fr. Terry P. Poems of the Elder Edda. University of Pennsylvania Press. 1990. p. 31. (3) The vernal equinox and summer solstice are no longer marked by these houses, of course, because the axis of the earth’s rotation itself turns in a cycle, producing a shift in the alignment of the constellations known as the precession of the equinoxes. (4) Jacobson T. The Harps That Once…; Sumerian Poetry in Translation. Yale University Press. 1987. p. 47. (5) This hypothesis is represented, for example, by Jean Clottes, lead researcher of the Chauvet Cave. See, for example: Clottes J, and Lewis-Williams D. The Shamans of Prehistory. Harry N. Abrams Publishers. 1998.